Dr. Frankenstein’s laboratory wouldn’t be complete without some electrical sparks. So for [Rick’s] final Halloween DIY hack this year he gives us just that, but with a twist. This time it’s a double helix Jacob’s ladder. The sparks are flying as they twist and turn their way up this unique design, powered by a standard neon sign transformer. If you can get your hands on a 15,000 V 30 mA transformer, you might have just enough time to build one for Halloween. The build is quite simple. Other than the transformer, you will need a few feet of ¼ inch flexible copper tubing and a piece of ¾ inch PVC pipe. After twisting the copper tubing around the PVC pipe to form the double helix, [Rick] mounts the tubing to a block of wood and removes the PVC form. 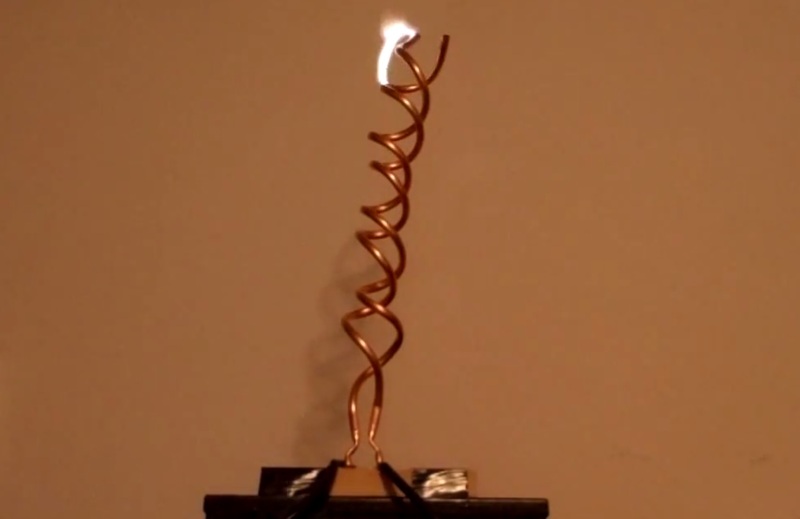 In his video, which you can watch after the break, [Rick] demonstrates a standard Jacob’s ladder, as well as his double helix design. The double helix version has a much nicer and slower traveling arc even stopping at times. You don’t want to set this up anyplace someone might touch it as it can be quite deadly or cause burns. [Rick] mentions not to use wood to mount your ladder because the wood will burn as it did during his testing. And do not operate unattended. Otherwise, it adds some spark to your great Halloween fun. salec wrote a reply on project log A quick one: copper-tape prototypes. Marcel van Kervinck liked A Cheap And Dangerous Garden Light Boost Converter.